Facing a top-10 program in Florida State, Kristen Rumley ’15 struggled to find her rhythm early in the first game of the tournament as she allowed two hits, a walk and two earned runs in the bottom of the first. Unrepresentative of her regular season performance, the three-time Ivy League Pitcher of the Year allowed hits in each of the six innings she pitched for a total of 10 hits over the course of the game. She also struck out five Seminoles batters, but walked two batters and gave up five earned runs. The game was close for the majority of the day, and the Big Green sat within striking distance at the bottom of the sixth. With two outs in the bottom of the sixth and the Big Green down 3-1, however, Rumley allowed a single to center field followed by a home run, which put Dartmouth too far behind to stage any comeback in the seventh. Seminoles starting pitcher Lacey Waldrop also struggled with her pitch control and issued six walks through 3.2 innings. After allowing a single to Rumley in the top of the second inning, Waldrop threw two wild pitches and walked Kelsey Miller ’16 and Chloe Madill ’17, loading the bases with one out. Waldrop got out of the jam after the Seminoles second baseman snagged a liner hit by Tiffany Dyson ’18 and touched second base for an inning ending double play. The Big Green loaded the bases again — this time with two outs — in the top of the third inning after Katie McEachern ’16 walked, Megan Averitt ’15 reached on a fielding error and Karen Chaw ’17 walked. Waldrop forced a Rumley ground out, and Dartmouth was unable to capitalize on back-to-back bases loaded opportunities. After a 3 hour and 42 minute rain delay in the bottom of the third, Waldrop walked Miller to lead off the fourth inning and forced two ground outs that moved Miller to third base. Waldrop’s day was cut short that inning after she issued a walk to Brittany Mann ’18. Seminoles pitcher Jessica Burroughs replaced Waldrop, inheriting runners on the corners. McEachern then hit a historic single, scoring Miller and batting in the first ever NCAA Tournament run in Dartmouth history. McEachern’s single, however, proved to be the only hit Burroughs allowed as she struck out four batters in the next three innings to close the game 5-1. In the second game of the tournament, Rumley would take the mound once more, but struggled in the first inning of the game yet again, allowing a bunt single and a double to open up the scoring for South Carolina. She was quickly able to settle in and return to her usual excellence, allowing one run on four hits over the next five innings. The offense was unable to provide any run support early in the game, as Gamecock starting pitcher Julie Sarratt limited the Big Green to one hit over the first five innings. Dartmouth would get on the scoreboard in the top of the sixth inning after McEachern and Averitt hit back-to-back singles that were soon followed by an RBI single by Chaw that plated McEachern for the first run of the afternoon. The Big Green had an opportunity to save their season after being down two in the top of the seventh inning as Miller doubled to start the inning and Dyson reached on a catcher’s interference. Claire Bird ’18 would pop up and McEachern would ground out for the final outs of the game. 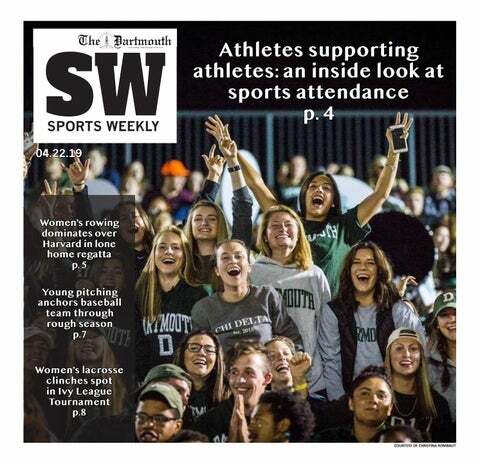 Facing two of the toughest lineups of her season, Rumley concluded her historic run as arguably the best Dartmouth softball pitcher to ever take the mound. She leads the program in career wins, strikeouts, shutouts, complete games, has pitched a no-hitter this season and is second in ERA (minimum of 80 innings pitched) behind Danica Giugliano ’04.